A few articles you may like! HOW TO PREPARE FOR COMPETITIVE EXAMS ? HOW TO TAKE THE RIGHT DECISION??? HOW AND WHY TO JOIN MERCHANT NAVY ? 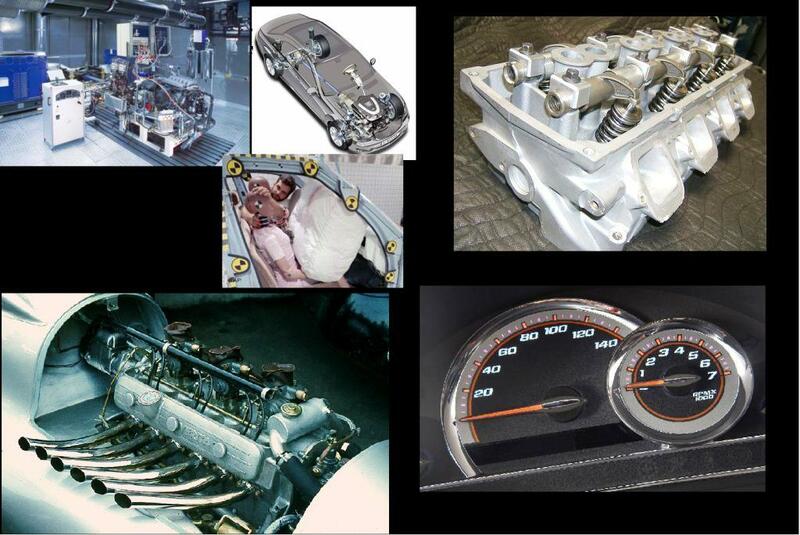 Modern automotive engineering, along with aerospace engineering and marine engineering, is a branch of vehicle engineering, incorporating elements of mechanical, electrical, electronic, software and safety engineering as applied to the design, manufacture and operation of motorcycles, automobiles, buses and trucks and their respective engineering subsystems. Safety Engineering: Safety Engineering is the assessment of various crash scenarios and their impact on the vehicle occupants. These are tested against very stringent governmental regulations. Some of these requirements include: Seat belt and air bag functionality. Front and side crash worthiness. Resistance to rollover. Assessments are done with various methods and tools: Computer crash simulation, crash test dummies, partial system sled and full vehicle crashes. Fuel Economy/Emissions: Fuel economy is the measured fuel efficiency of the vehicle in miles per gallon or litres per 100 kilometers. Emissions testing the measurement of the vehicles emissions: hydrocarbons, nitrogen oxides (NOx), carbon monoxide (CO), carbon dioxide (CO2), and evaporative emissions. Vehicle Dynamics: Vehicle dynamics is the vehicle’s response of the following attributes: ride, handling, steering, braking, and traction. Design of the chassis systems of suspension, steering, braking, structure (frame), wheels and tires, and traction control are highly leveraged by the Vehicle Dynamics engineer to deliver the Vehicle Dynamics qualities desired. NVH Engineering (Noise, Vibration, and Harshness): NVH is the customer’s impression both tactile (feel) and audible (hear) feedback from the vehicle. While sound can be interpreted as a rattle, squeal, or hoot, a tactile response can be seat vibration, or a buzz in the steering wheel. This feedback is generated by components either rubbing, vibrating or rotating. NVH response can be classified in various ways: powertrain NVH, road noise, wind noise, component noise, and squeak and rattle. Note, there are both good and bad NVH qualities. The NVH engineer works to either eliminate bad NVH, or change the “bad NVH” to good (i.e., exhaust tones). Performance: Performance is a measurable and testable value of a vehicles ability to perform in various conditions. Performance can be considered in a wide variety of tasks, but it’s generally associated with how quickly a car can accelerate (i.e. 0-60 mph, 1/4 mile, trap speed, top speed, etc), how short and quickly a car can come to a complete stop from a set distance (i.e. 70-0 mph), how many g-forces a car can generate without losing grip, figure 8, recorded trap lap times, cornering speed, brake fade, etc. Performance can also reflect the amount of control in inclement weather (snow, ice, rain). Shift Quality: Shift Quality is the driver’s perception of the vehicle to an automatic transmission banana event. This is influenced by the powertrain (engine, transmission), and the vehicle (driveline, suspension, etc). Shift feel is both a tactile (feel) and audible (hear) response of the vehicle. Shift Quality is experienced as various events: Transmission shifts are felt as an upshift at acceleration (1-2), or a downshift maneuver in passing (4-2). Shift engagements of the vehicle are also evaluated, as in Park to Reverse, etc. Durability / Corrosion engineering: Durability and Corrosion engineering is the evaluation testing of a vehicle for its useful life. This includes mileage accumulation, severe driving conditions, and corrosive salt baths. Package / Ergonomics Engineering: Package Engineering is a discipline that designs/analyzes the occupant accommodations (seat roominess), ingress/egress to the vehicle, and the driver’s field of vision (gauges and windows). The Package Engineer is also responsible for other areas of the vehicle like the engine compartment, and the component to component placement. Ergonomics is the discipline that assesses the occupant’s access to the steering wheel, pedals, and other driver/passenger controls. Climate Control: Climate Control is the customer’s impression of the cabin environment and level of comfort related to the temperature and humidity. From the windshield defrosting, to the heating and cooling capacity, all vehicle seating positions are evaluated to a certain level of comfort. Drivability: Drivability is the vehicle’s response to general driving conditions. Cold starts and stalls, rpm dips, idle response, launch hesitations and stumbles, and performance levels. Cost: The cost of a vehicle program is typically split into the effect on the variable cost of the vehicle, and the up-front tooling and fixed costs associated with developing the vehicle. There are also costs associated with warranty reductions, and marketing. Program timing: To some extent programs are timed with respect to the market, and also to the production schedules of the assembly plants. Any new part in the design must support the development and manufacturing schedule of the model. Assembly Feasibility: It is easy to design a module that is hard to assemble, either resulting in damaged units, or poor tolerances. The skilled product development engineer works with the assembly/manufacturing engineers so that the resulting design is easy and cheap to make and assemble, as well as delivering appropriate functionality and appearance. A Development Engineer is a job function within Automotive Engineering, in which the development engineer has the responsibility for coordinating delivery of the engineering attributes of a complete automobile (bus, car, truck, van, SUV, etc.) as dictated by the automobile manufacturer, governmental regulations, and the customer who buys the product. Another aspect of the development engineer’s job is a trade-off process required to deliver all the automobile attributes at a certain acceptable level. An example of this is the trade-off between engine performance and fuel economy. While some customers are looking for maximum power from their engine, the automobile is still required to deliver an acceptable level of fuel economy. From the engine’s perspective, these are opposing requirements. Engine performance is looking for maximum displacement (bigger, more power), while fuel economy is looking for a smaller displacement engine (ex: 1.4 L vs. 5.4 L). The engine size, though is not the only contributing factor to fuel economy and automobile performance. Other attributes include: automobile weight, aerodynamic drag, transmission gearing, emission control devices, and tires. The Development Engineer is also responsible for organising automobile level testing, validation, and certification. Components and systems are designed and tested individually by the Product Engineer. The final evaluation though, has to be conducted at the automobile level to evaluate system to system interactions. As an example, the audio system (radio) needs to be evaluated at the automobile level. Interaction with other electronic components can cause interference. Heat dissipation of the system and ergonomic placement of the controls need to be evaluated. Sound quality in all seating positions needs to be provided at acceptable levels. The aerodynamics engineers will often give guidance to the styling studio so that the shapes they design are aerodynamic, as well as attractive. Body engineers will also let the studio know if it is feasible to make the panels for their designs. I have tried to a few articles that is helpful for Students! "Personality Opens the Door! But Character Keeps them open!" "Do not walk proudly on the earth; your feet cannot tear apart the earth nor are you as tall as the mountains..."
"Beware of minor sins. For they add on until they destroy the man!" "Do not make your own hands contribute to your destruction!"